Creating dynamic Web sites is why you use ASP.NET 3.5. It can help you to create a reunion Web site for multiple users or to expand your business site to enable online shopping. And when you integrate LINQ queries to help sort through the info on your Web site, you make your Web life easy living. ASP.NET 3.5, with its access to LINQ query clauses, is a valuable tool in creating a dynamic Web site, whether you’re designing a site for your ultimate Frisbee team or to offer online shopping to your customers. 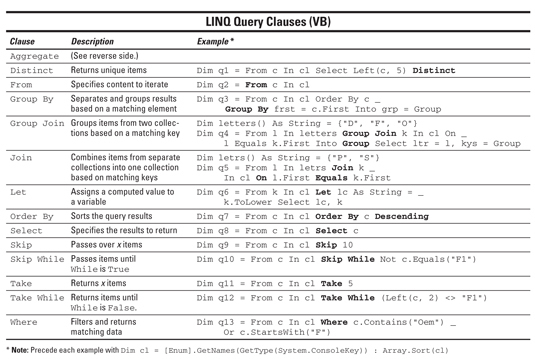 The following table describes LINQ clauses in Visual Basic and offers examples for each. Don’t look here for the Aggregate clause — it merits its own table. Note: Precede each example with Dim cl = [Enum].GetNames(GetType(System.ConsoleKey)) : Array.Sort(cl). ASP.NET 3.5 in tandem with LINQ makes writing queries for your Web site a snap — or at least pretty easy. One of the most-used queries is Aggregate, which helps you find any or all of the queried terms, and can do counting and averaging for you. The following table shows the Aggregate function, describes what it does, and gives an example for each. Note that you need to precede each example with Dim dw = [Enum].GetNames (GetType(System.DayOfWeek)).